Osteochondral lesions of the talus present a formidable treatment challenge to the orthopaedic surgeon. Historical cartilage repair strategies often result in the formation of fibrocartilage leading to suboptimal clinical results. With advances in regenerative medicine, modern surgical techniques are diverse and employ autograft, allograft, and tissue-engineered constructs for cartilage repair. Fresh and particulated juvenile allograft transplantation have become popular options in the United States. Wordwide, both cellular and acellular tissue-engineered constructs are utilized. In all cases, there is still debate as to the optimal cell source and scaffold material and only short-term clinical results are available. 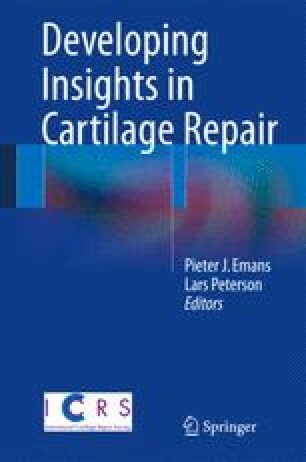 This chapter will review these current as well as experimental techniques for cartilage repair of osteochondral lesions of the talus.